Spider-Man reluctantly enlists Black Cat and Venom, alongside with Captain America, Cloak and Dagger, and Iron Fist to battle the bloodthirsty symbiote's posse. This series has come to be known for the sheer number of Spider-Man characters assembled, and for giving us a tantalizing look at how Carnage, a blood-thirsty psychopath, could lead a team of villains that were even scarier than him (which didn't seem possible). 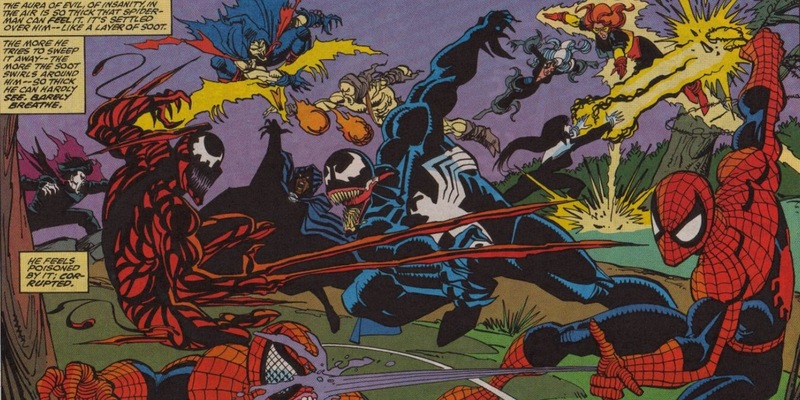 The crossover even brought us a serviceable video game, Spider-Man and Venom: Maximum Carnage, based on the comic arc. Ever since the Maximum Carnage event, the crimson symbiote has been a fan favorite because of his raw ruthlessness and Kasady's lust for bloodshed.